Will the car insurance company pay for my rental car? 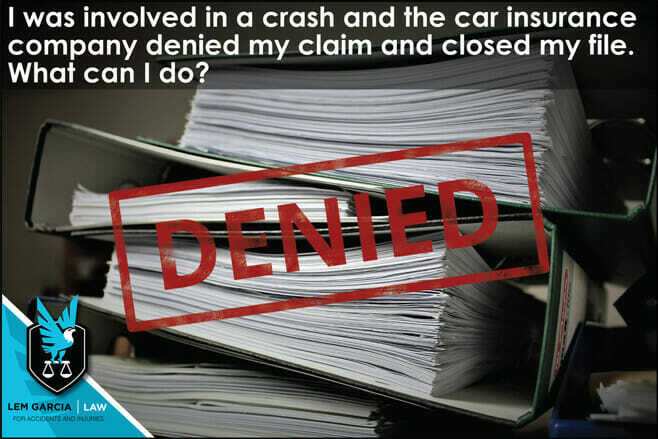 If you have been dealing with the insurance company on your own after a crash and were told that they are going to deny your claim and close your case, there is still a lot that you can do. The reason why the insurance company denied your claim is because they feel as though they have reasonable grounds to deny that they are liable for your damages or that you did not suffer any damage due to your crash. Even though the insurance company denied your claim, it does not mean that your case is closed and there is nothing you can do about it. If you find yourself in this position, it is important that you speak to a personal injury lawyer that is experienced with handling car accident cases from beginning to end. An experienced personal injury lawyer will help determine whether the insurance company is liable for your damages and how much the insurance company should pay you for your damages. If this happened to you, do not feel as though you are being targeted. It is very common that an insurance company will deny your claim. If the insurance company has any reasonable grounds to deny your claim, there is a good possibility that they will. It is important to remember that insurance companies profit greatly from denying claims or paying out as little as possible for claims. They are in the business of making money, not of paying claims out for as much as they are worth. Even if your case seems relatively straightforward, do not be alarmed that the insurance company will not accept liability. Even if it is clear who is at fault, they might try to bully you into accepting less than what your case is worth. They will hold onto any argument they can no matter how tenuous their argument may be just to save themselves a few dollars. We have handled many cases where the insurance company initially denies someone’s claim and then we are able to get them insurance company to reverse their decision and pay our clients a fair amount for their vehicle and their injuries. West Covina car accident attorney, Lem Garcia, offers free consultations for people who have been injured in car accidents. Call us today for your free, no-obligation, consultation.